Our contract with the Government of Yukon expires December 31, 2018. We are already gearing up for a strong start to the bargaining process, but we need you. Bargaining proposals come from the members. Nominations for the Bargaining Input Committee come from the members & the Bargaining Teams are elected by the members. Do you have an idea to improve working conditions in your workplace? Is there something in our contract that just needs fixing? Please print the Bargaining Input form linked below, complete it with supporting signatures and submit it to your Local President, to the Yukon Employees’ Union, or to the PSAC Regional Office before the Bargaining Input Deadline of June 15th. Not sure how? We hope to have a new contract ratified by the time our current contract expires December 31, 2018 but we need your help to make that happen. Please, get involved now and stay informed throughout the important process of bargaining. READ THE CURRENT COLLECTIVE AGREEMENT. Make note of any articles you think need to be updated, changed, or improved and complete the Bargaining Input form linked above. Deadline to submit – June 15. *New language has been added to the Collective Agreement between YEU/PSAC and the Government of Yukon. Article 19 Severance provides for voluntary early pay-out of severance pay under certain conditions. It is important to remember this new provision is voluntary only – there is NO requirement to request an early payout of your severance. All other forms of severance such as the provision for layoff remain intact and are unchanged. Severance is like a deferred long term savings plan. For every year you work you will have one week of pay set aside for when you retire. For employees who plan to work until they retire, the value of severance is 1 week of pay for each year of service, which is like having an additional 1.9% that is set aside annually for you by the employer. The monetary “value” of severance varies considerably from person to person depending on years of service, your career plan, and the conditions under which you might expect to take severance pay. 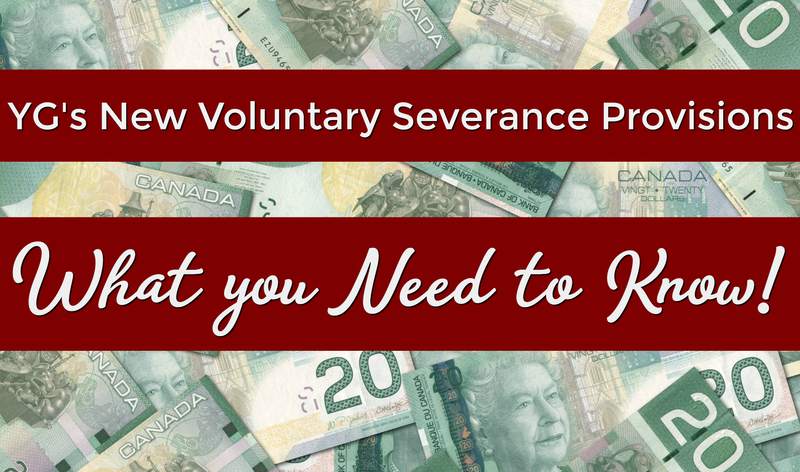 Severance is intended to bridge your time between when you retire and when you get your first pension cheque or provide additional pay in the event you are laid off. There are occasions where several months elapse between the date of retirement and receipt of the first pension payment. How will the new Voluntary Severance Pay-Out article work? If you voluntarily take an early payout of your severance and you are still employed, there may be additional tax payable. Any additional taxes will be your responsibility and will vary from person to person depending on your personal financial situation. Another important factor to consider is you more than likely will be at a higher pay level when you retire. This means severance will be paid out at a higher level when you retire. *If you cash out early, you will continue to accrue severance, but like a savings account, once you withdraw severance, it is gone. It can’t be replaced or replenished over time. *We recommend you do not access this provision unless you absolutely have to. b) An employee may request a voluntary severance pay-out each time the employee accrues another five year increment of severance. c) Request for pay-out must be made by September 30 each year. d) Voluntary severance will be paid on the pay day falling immediately after November 1.
e) An eligible employee is entitled to be paid by the employer severance pay equal to the product obtained by multiplying the employee’s weekly rate of pay by 1/2 by the number of full-time equivalent completed continuous years of service requested for pay-out to a maximum of 28 weeks. f) The number of years of voluntary severance paid out will be subtracted from remaining accrued balance of severance for the purposes of Article 19.
g) An employee’s future earning and accrual of severance shall remain unaffected. Yukon’s Hospital Workers Ink Tentative Deal with Hospital Corp.
Yukon School Bus Drivers… on the road to nowhere? Yukon School Bus Drivers have been trying to meet with their employer Takhini Transport since last summer. The employer has flat out refused. Now they’re asking for your help. 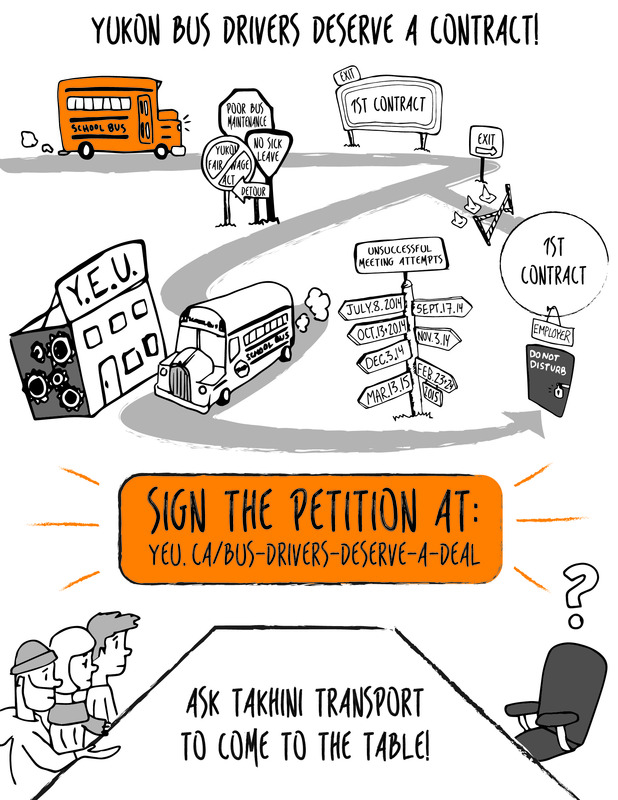 Please sign their petition; ask Takhini Transport to meet their workers at the bargaining table… they deserve a deal!